Four years ago today I married the woman that is now my pillion. Four years that have been far from smooth. Four years that has demanded change from a person that resists change like a brick wall resists wind. I'm not sure if you can tell, but I never thought I would end up married. I always thought the expense was silly for a simple piece of paper that says we are together. But regardless of my thoughts and beliefs here I am, four years later, bound by a piece of paper and all manner of things that I don't believe in. Saying that things haven't been smooth is a bit of an understatement. It's been pretty damn rough and for the most part, I've been the root cause of it all. My nature is to be resistant, hard headed, and solitary. I am an only child and while not spoiled, I certainly was able to have my way and spent a lot of my time alone doing things that I wanted to do. I detest having people relying and being dependant on me and I hate being proded into making decisions. Can you get a hint of what I'm like to live with? Well, my fellow rider through this pot hole laden life, has held onto that pillion and weathered through it all. She has put up with every storm that I've thrown her way and even made a few of her own which have changed me and my views. At one point we had almost taken separate roads, but the introduction of a rather sleek mistress changed that. Selene glided into the picture on a rather mundane trip to the local dealership. Oh, and get this...it wasn't my idea. How many men can actually say their wife encouraged them, nigh pushed them into getting a motorcycle? If you can be counted among those, consider yourself lucky...as I'm sure you do. Selene was originally going to be my transportation as I went my separate way, but she seemed to steer me in another direction. She gave me the ability to disappear and dwell in my own little world. The chance to get away from everything and make it not exist if only for a few hours. 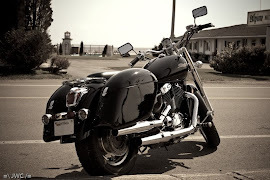 She became my decompression tank and I left many a mile of stress behind while riding. After that, things got better. A long distance ride that was supposed to be solo ended up being two up. She braved a stock seat and miserable weather on a ride to Ontario and back not being able to talk to anyone while moving and thoroughly enjoyed it. That ride put a link between us again and harkened back to the days when the only transportation we had was a motorcycle. Mind you, things aren't perfect. We still have our problems and I still have my times, but I'm working on it. I'm happy to be where I am and I'm happy to be with her. Believe me, that's a long way from where I was not too long ago. Looks like one loud, well designed machine did more than one over paid shrink could ever do. Here's to us! And here is to the mistress that showed me the way. I just looked at the calendar... Did anyone else realize that we are already into July? Ugh, summer is too short and there just isn't enough nice days that correspond with my days off. Have you ever been out riding and realized that you probably shouldn't be? I went out for a spin yesterday to snap some pictures and found that Selene and I were meshing really well. A little too well. I found I was taking chances that I usual don't and had way too much attitude. I was easily doing double the speed limit in some areas and weaving around traffic in other areas. While I'll admit that it was quite fun and my invincibility seemed to be holding out quite well, there would come a time when reality would smush my little shield and then I would have more repairs to pay for...among other things. So I cruised home, parked Selene and relaxed for the rest of the day. If I get too many of those day, I'll have to get a track bike.